Teaching excellence in the martial arts since 1963. Click to Start Training Today! We're glad you're here, and we'd love to have you join our martial arts family. Give us a call and let's find a way to meet your training goals. 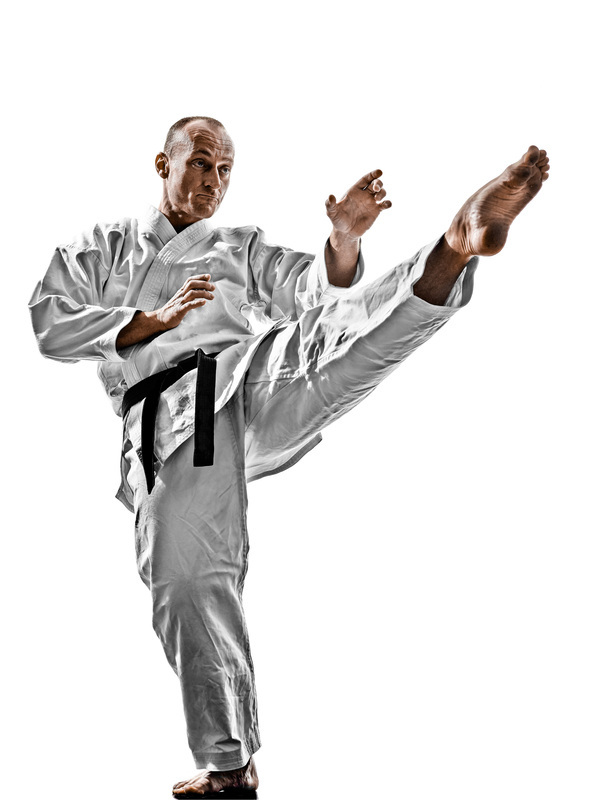 At Armentor's United Martial Arts, we teach more than just how to kick or punch. We help our students grow and improve their lives both physically and mentally. Be a Part of a Great Tradition! and we would love to help you reach yours! We're here to help! Call today at (409) 962-8334 to ask about your first class! 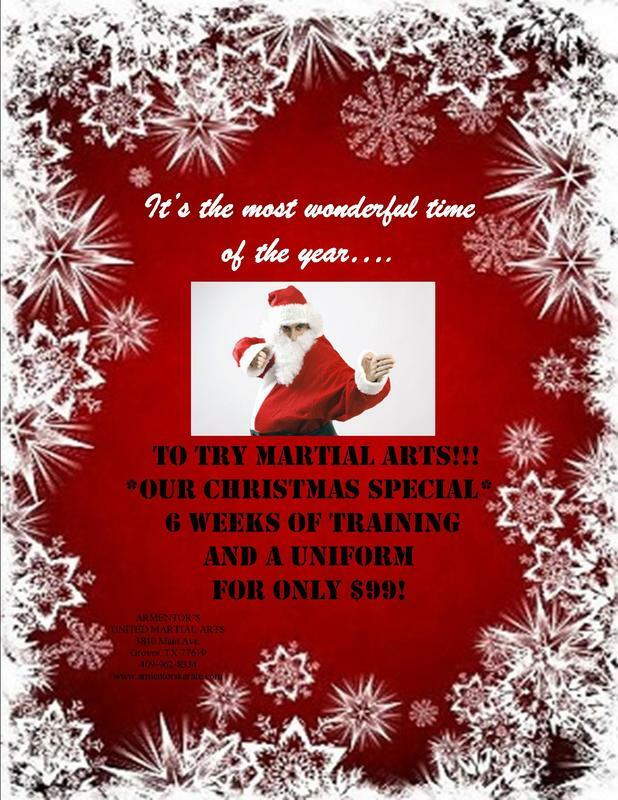 Give the gift of Martial Arts! 6 weeks of training + a uniform and mouth guard for only $99! ﻿ We pride ourselves on friendly service and a family atmosphere, and we're here for only one reason: to help you or your children reach your goals.​ Our classes are fun, fast-paced and full of great content. Every class includes a vigorous workout, "mat chats" covering character traits, lessons over martial arts skills and practical drills to help students improve. Students will see an improved fitness level, sharper focus at school or work, better discipline at home and increased confidence. Our training translates to other areas of life. School teachers, parents and grandparents applaud the benefits of our training. Last year I had three boys in my 5th grade homeroom who were students at Armentor’s United Martial Arts. They asked if their instructor could come and lead them in a demonstration for our class. I truthfully did not know what to expect, but I was pleasantly surprised by the demonstration. The martial arts skills they demonstrated were very interesting. But, the part that really impressed me was that throughout the demonstration their instructor talked about how their lessons were conducted. Not only do the students learn martial arts skills, but they are taught about respect for others and for themselves. They are taught about self-discipline and how to be leaders amongst their peers. And perhaps most important for a teacher, they are taught to always give their best effort in whatever they are attempting. Armentor’s United Martial Arts has been outstanding for my son. He has been attending for just over 2 years, and we have noticed that the many things he learns at Armentor’s have a very positive influence on him. Armentor’s does a great job of teaching Martial Arts, but they also teach, encourage, and reinforce great character traits in each of their students; such as honesty, integrity, responsibility, and respect. They have also taught him how to set goals for himself and instill the motivation to achieve them. I would recommend Armentor’s United Martial Arts for any child. They not only teach important life skills, but also reinforce all the positive things that we, as parents, try to teach them at home. When we moved to this area, my 6-year-old daughter had a hard time. She was VERY shy and at a new school. Mr. Trent came to her class one day for a show and tell demonstration. She begged me to try Armentor's out, and I am so glad we did. She just LOVES her martial arts classes there. She has gained a ton of confidence and looks forward to classes every week. As a parent, I really appreciate the instructors and the example they set for the kids. They teach them respect, self-discipline and kindness while still showing them how to defend themselves if they ever need to. My 5-year-old son was so excited to see what his sister has learned that he has now joined as well. Armentor's has been a wonderful place for our family. They genuinely care for the kids and strive to teach them life skills that our children need. Our daughter attends this school, and she loves going to learn and make new friends. She is always excited to tell me about her class and what she practices every day. The staff is very helpful and friendly, and they are good with the kids. There is never a dull moment, and the classes are a great balance between being serious and having fun. Our daughter has gained a better understanding of respect, confidence in herself, consideration for others, improved listening skills and better focus. We love this place and the teachers that dedicate their time to teaching these kids. It's not just a place to learn karate. The kids learn a good way of living and how to be the best person they can be. It feels like a family. We would highly recommend these classes for any age! Last year, we considered karate lessons for our two sons. Our seven year old tried some classes and he loved it! Our older son was not as eager, but with encouragement he took some classes and loved it as well! When it's time to go to class, the have no hesitation in getting in uniform. They are so excited! Our older son can be quite shy generally, but he has no problem showing off his latest skills to anyone. I have found the staff to be very friendly and professional. They have outstanding patience, and they treat the students with kindness and respect. In turn this teaches the children kindness and respect and instills discipline. I am very pleased with Armentor's. The atmosphere is a positive one with no judgement. Seeing the pure joy in my kids' faces when the have accomplished a great feat is priceless. They are so proud of themselves and it shows.